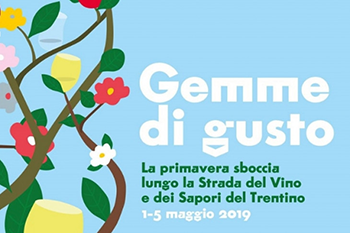 Gemme di Gusto includes a various number of events in Trentino region from Wednesday 1st to Sunday 5th May. These events deal with colours and flavours that tell of the food and wine enchantments of Trentino through the awakening of nature. Outdoor initiatives across vineyards, olive groves, woods and meadows in bloom enhanced by delicious wine tastings and excellent food. On Thursday 2nd May there will be a dinner at the Cantina Storica Mezzocorona Rotari, located at San Michele all'Adige, where visitors can discover spontaneous herbs matched with several kinds of wines.